The timing of this post (which is a bit of a personal one) has been prompted by the sad death of David Mackay-his book http://www.withouthotair.com/ stimulated Hannah and myself to crudely look at Agriculture in the way that David had so impressively looked at for Sustainable Energy – Hannah describes this much better than I ever could in her pesonal blog – https://convergingworldsite.wordpress.com/2016/04/17/remembering-david-mackay-and-his-unique-approach/. Dave looked at Sustainable Energy based on the UK – how much energy do we individually consume and how could we supply it with sustainable sources, by crunching the numbers, laying it out simply, not letting precision, lack of data or ethical argument get in the way. UK is only 60% self-sufficient in food. 80% of UK agricultural land is used directly or indirectly for livestock. Meat, dairy and egg products provide <1/3 of dietary calories. On paper these crops appear to crudely provide the recommended dietary needs of the poulation. >50% of UK agricultural land is suitable for arable agriculture. It appears that the UK could readily be self-sufficient in food but not with the very inefficient livestock systems that agriculture operates. This analysis scales throughout the globe and when you crunch and analyse the numbers it’s shocking how inefficient our livestock agricultural systems are and these inefficiencies appear to be driving huge sustainability issues in feeding an expanding population, water security, major biodiversity loss and climate change. The big difference between Dave MacKay’s analysis on sustainable energy was how challenging it looked ; but in agriculture there is an obvious huge non-essential inefficiency – the extent of livestock farming and meat consumption. This has been on my mind ever since – thinking as an engineer – how have we managed to evolve to such a damaging inefficient system (it just seems daft; but we’re too close to notice) and what can we do about it – we’re rapidly moving in the opposite direction. Even more challenging – I actually like meat and don’t want to be a vegetarian. Up to recent times (I’ll put a marker down at mid 1960s when we had half of the global population that we now do), livestock could balance in an integrated agricultural system – we had pasture for cattle, sheep, poultry and pigs could be significantly sustained by spoil and waste, manure could be recycled as feriliser etc – integrated systems reduced inefficiencies and up to a point land availability wasn’t overpressurised into unsustainability. We’ve sinced pushed our boundaries well beyond sustainability through very high poulation growth, urbanisation, increased consumption of in particular meat. This has been produced through non-integrated industrial agriculture (mono-cultures). In these industrialised livestock systems the inefficiencies are much clearer – without the pasture the inefficiencies of grain in / meat out are simple, the generation of huge quantities of waste decoupled from arable agriculture input means that the previous resource becomes a damaging waste. What do you do when you want more meat and there’s no pasture land available – cut down the forest – or rely on imports which do? So we have a huge but avoidable (?) problem – but why mycoprotein and specifically University of Strathclyde’s integrated technology? Mycoprotein has been around for decades as a niche vegetarian product and doesn’t appear to be saving the world or transforming agriculture. High waste production and environmental impact. Efficient conversion of grain (weight doubles every 6hrs as a net producer of protein). No waste process- value integration with the bio-refinery. Most people (including myself) appear to if specifically choosing, select a nice piece of meat but for the majority of their general consumption are looking for sensible tasty food and although not used to choosing the vegetarian option if given mycoprotein-based foods find them quite nice and appealing. Mycoprotein to me looks as if it offers a good healthy and sustainable alternative for general consumption but if it is to make a difference needs to be BIG and CHEAP! Adjectives – I know but that’s where my more conventional process engineering number-crunching experience feels more at home – the 3F BIO technology integrated with existing bio-refineries offers a BIG and CHEAP solution making mycoprotein significantly cheaper than meat. Healthy, Sustainable, Big, Cheap, Premium texture – I think it has potential! But is mycoprotein the answer? 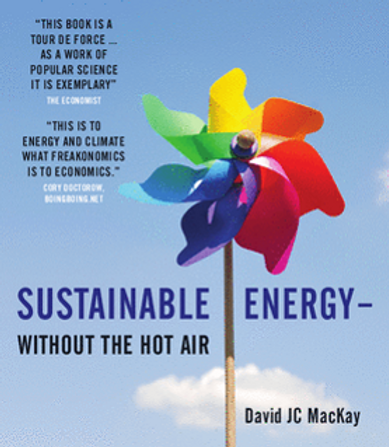 Back to David Mackay’s Sustainable Energy assessment – his key conclusion was that there was no single answer – just a set of difficult choices and probably a bit of everything. We’re going to have to manage meat consumption – a bit like CO2 emissions – hopefully before we do too much more damage. This will have to result from increased awareness of the personal and global impact changing societal norms in the general population, not just a vegetarian minority. I’m sure this will result in general reduction and choices away from beef towards chicken accompanied by more conscious consumption. (This is where I would place myself although I could/should do more). I believe that Eating mycoprotein reinforces conscious consumption; conscious consumption reinforces mycoprotein – I think/hope it has a role! Thanks to David Mackay for the thinking processes that got us started.